MRP stands for Material Requirements Planning. It involves planning appropriate production, Controlling inventory and scheduling. It is integral part of managing the manufacturing processes. Most of the Material requirements planning (MRP) systems are software-based, but MRP can be conducted by hand as well. Establish the necessary materials for production and also endure that the products are ready for customers. Sustain the lowest inventory possible such as materials and products in store. Arrange manufacturing, purchasing activities and scheduling deliveries. Within the manufacturing industry, business systems have gradually advanced in functionality over the years. The initial systems were referred to as MRP, since there was an inventive component within it called MRP. This module computed purchase and work order requirements constructed from the forecast or the actual demand for products. Later on, the MRPII (Manufacturing Resource Planning) emerged as the next generation that constituted integrated manufacturing systems (Kim, 2014). This advanced generation made use of more complex, iterative planning cycles to take care of the capacity of the factory as well as the material needs. 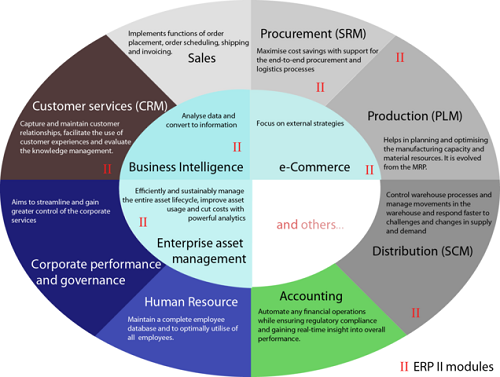 The MRPII systems were later on substituted by ERP (Enterprise resource planning) systems which had advanced applications took care of industry needs beyond manufacturing (Kurbel, 2013). Taking note of this background information, this work explores the differences between ERP and MRP. MRP is basically a solution tool used in production planning and in the control of inventory. An MRP incorporates data and information from the production schedules with the data derived from inventory and bills of the elements required to build a product (Kim, 2014). MRP system has three primary functions. Firstly, this system makes sure that there are no shortages of the proper materials required in the manufacture of products. In addition, MRP system ensures that waste is reduced through maintenance of the lowest possible level of inventory and materials (Sheikh, 2003) Furthermore, MRP system facilitates in the planning of manufacturing functionality, purchasing and schedule delivery. Hence, when performing its functions, MRP ensures that there is no wastage of materials or material shortages. However, information and data entered into the system must have a high standard of accuracy to avoid serious production and stock faults. Data warehousing- this function entails management of documents and files. Project management- this function covers time, cost and time management. Accounting- this function entails management of nominal ledgers, accounts sales and fixed assets among others. However, ERP is commonly used in many companies as there is a perceived benefit that it offers a single lasting solution for the management of an entity’s processes and information structure( McGaughey & Gunasekaran,2007). de. "Difference Between ERP and MRP." DifferenceBetween.net. March 27, 2018 < http://www.differencebetween.net/business/difference-between-ail-and-ale-difference-between-road-and-rodeerp-and-mrp/ >. Kurbel, K. (2013). Enterprise resource planning and supply chain management. Heidelberg: Springer. Sheikh, K. (2003). Manufacturing resource planning (MRP II). New York, N.Y.: McGraw-Hill.